POWERFUL CHARGE: Outstanding 4000mAh UL-certified internal battery for your Galaxy S9 effectively charges well over 100% to last you the entire day. The built-in battery provides up to 1.5x your normal battery power. 100% compatible to support Android OS 8.0+ (Oreo) & older, future Android OS software updates. 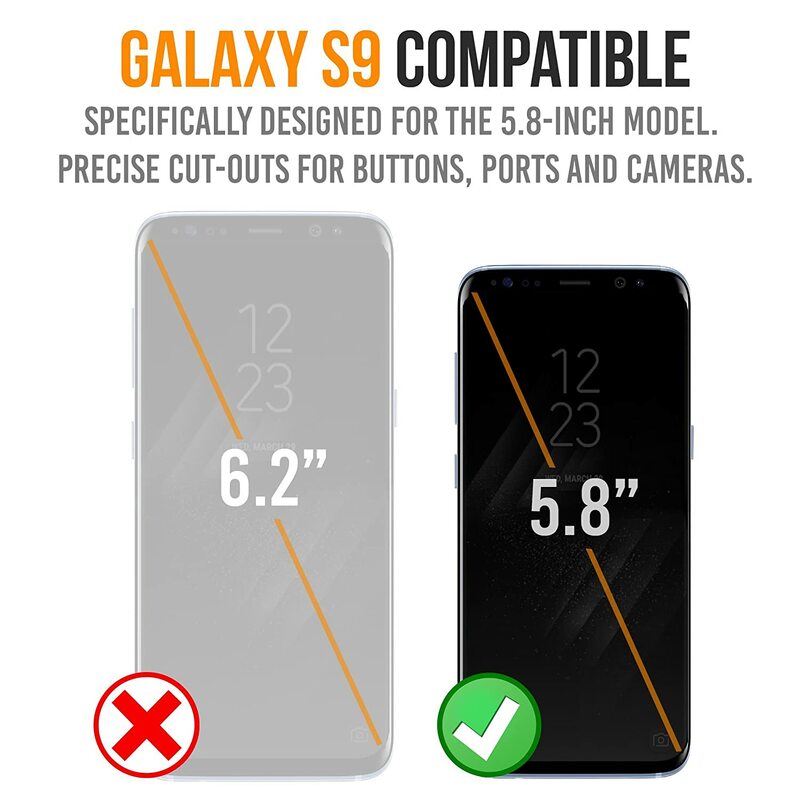 ONLY compatible with Samsung Galaxy S9, 5.8" (*NOT compatible with Galaxy S9 Plus 6.2"). 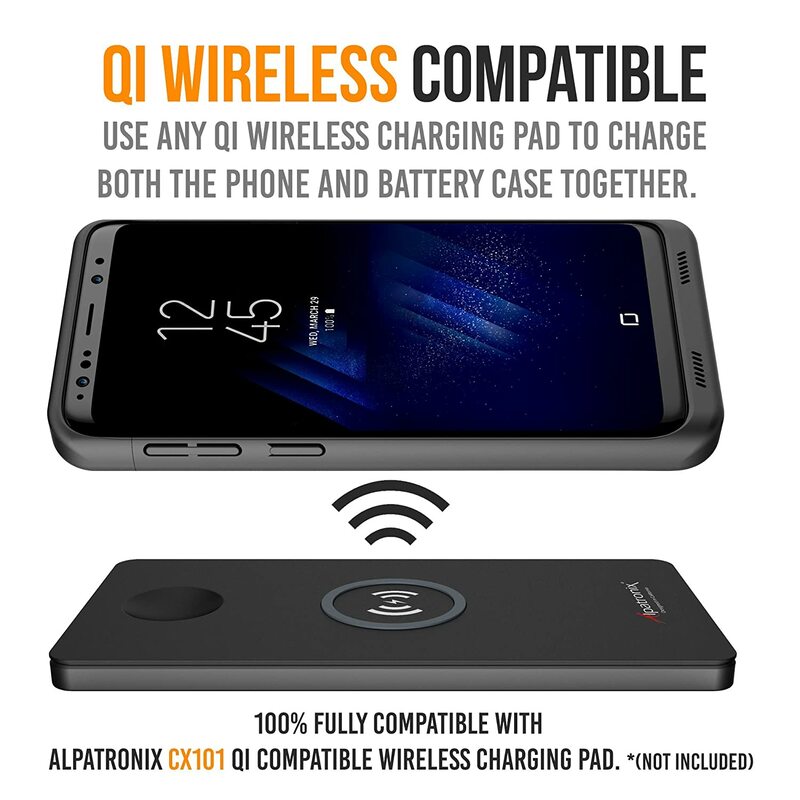 COMPATIBLE WITH Qi WIRELESS CHARGING: Charge with a Qi wireless charger pad (not included). You can use any Qi wireless charging pad to charge both the Galaxy S9 and the battery case together. 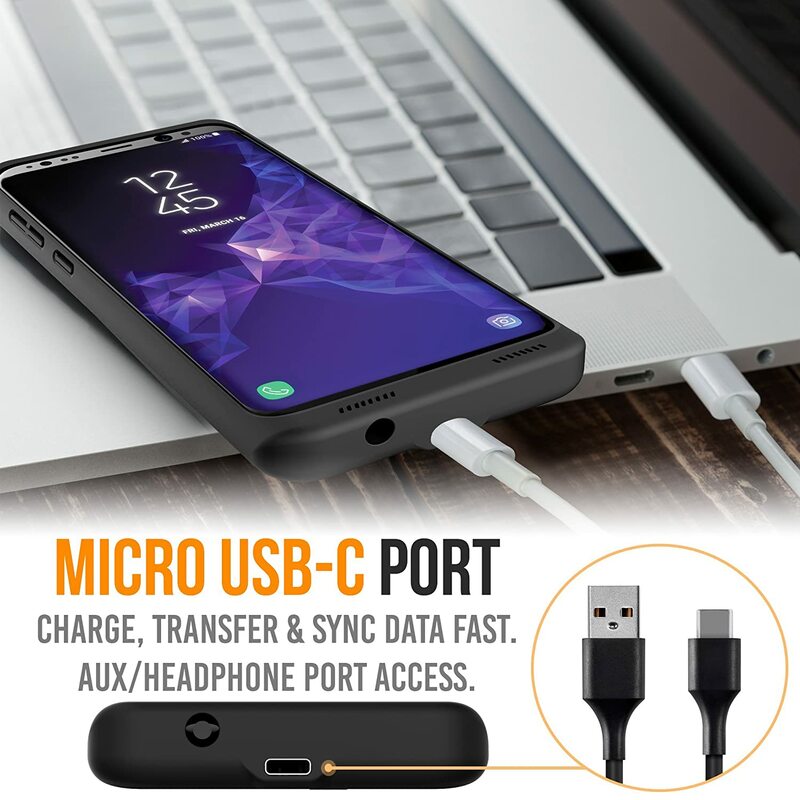 You can also charge the battery case using the USB-C cable included with your Galaxy S9. Receive 10% OFF our CX200 wireless charging stand (ASIN: B07HBDFFKK) OR 20% OFF our CX101 wireless charging pad (ASIN: B0798X8Y9K) when you purchase BOTH the battery case and ONE of the wireless chargers together. 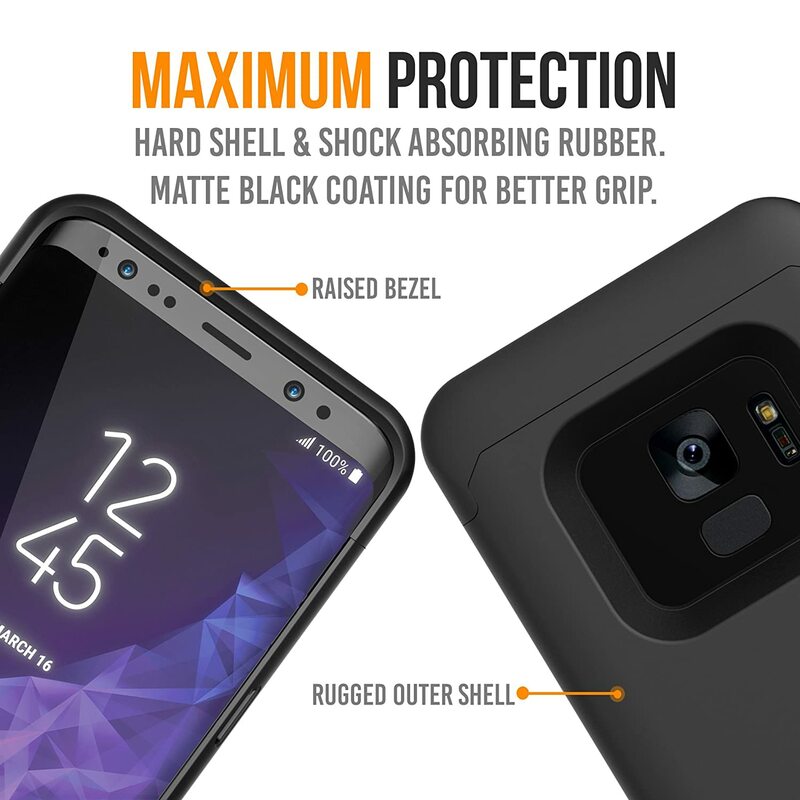 MAXIMUM PROTECTION: 360° scratch-guard protection minimizes bulk and weight for Galaxy S9 charger case. Raised front bumper stands higher than your Galaxy screen to avoid contact with other surfaces. Easy access to all ports, sensors, speakers and camera. This battery case has the highest industry regulatory certificates: CE, RoHS, and FCC. EASY & SIMPLE INSTALLATION: Remove top piece and slide the Galaxy S9 to connect to the battery case's USB-C output port. Once Galaxy S9 is seated, reconnect the top piece in the correct orientation and snap into place on all sides. 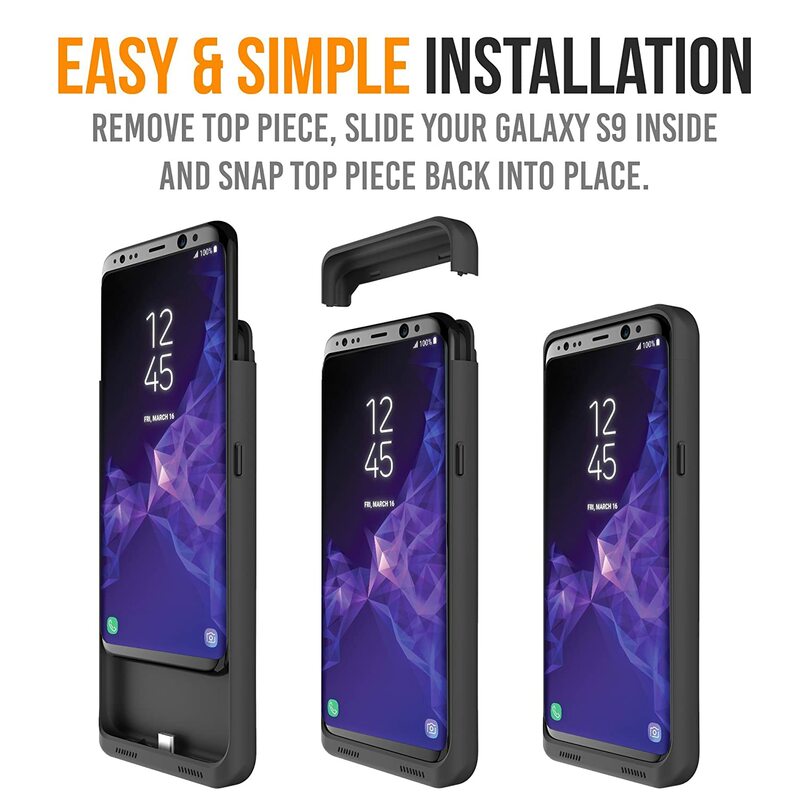 To remove your Galaxy S9, simply remove the top piece and slide your Galaxy S9 out. You can conveniently charge and sync both the battery case and Galaxy S9 to your PC, laptop or Macbook without having to remove the battery case. LIFETIME WARRANTY: Ensures you are protected for the life of this product and 30-DAY MONEY-BACK GUARANTEE offers peace of mind, enabling you to return the product in case you don’t like your purchase for any reason. 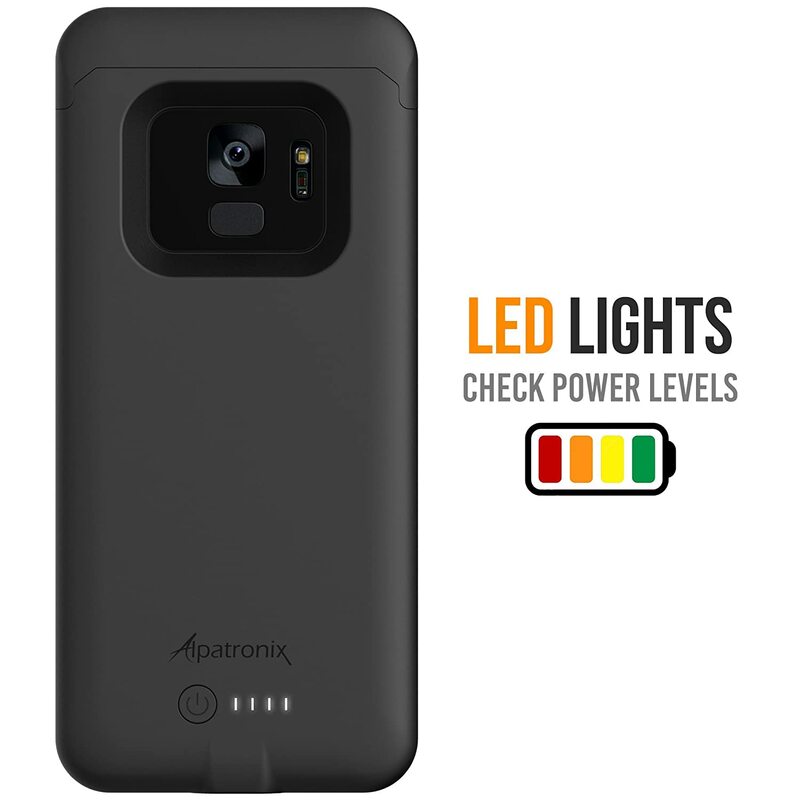 I had previously bought an Alpatronix battery case for my Samsung Galaxy S6, which ended up being a huge help for me as the phone (and its battery) was rounding out its second year of use. 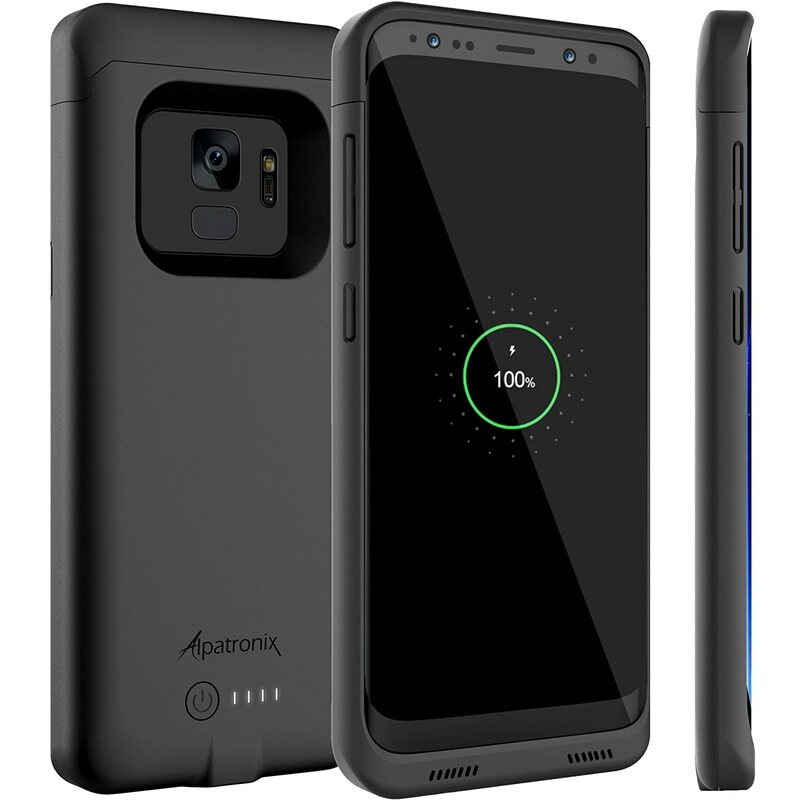 Upon upgrading to the S9, I knew I didn't want to wait until the phone's internal battery had been shot before investing in another Alpatronix case, so I immediately placed an order for one upon getting my new phone. While I haven't had much use with the case just yet, I can say that the build quality of the case is great--it has a nice, smooth matte feeling to it which complements the phone quite well. 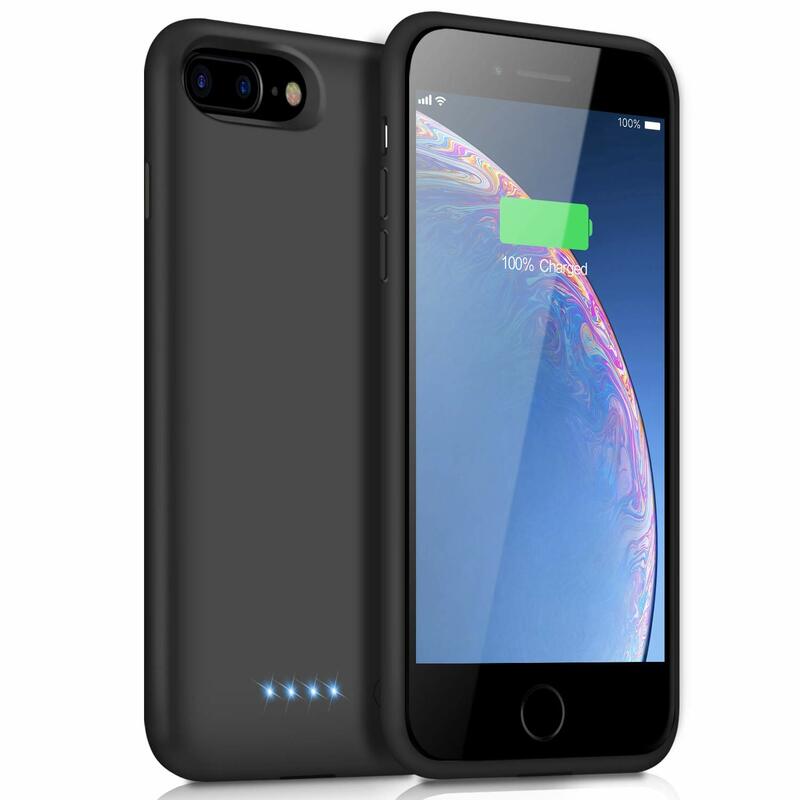 The case also features a fairly subdued charging battery on the back next to the four slim LEDs that indicate the level of charge the case battery is currently holding. 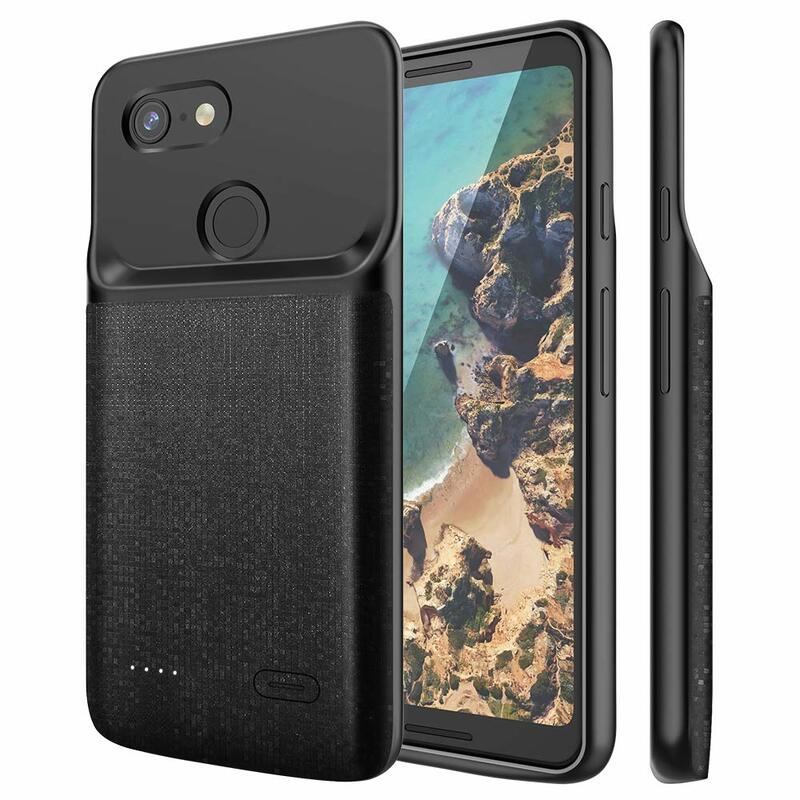 I will say I'm a little disappointed that the case design doesn't create more of a buffer border to help protect the edges of the phone screen, but some people may prefer the lower profile look--it does help the case reduce bulk. Another minor nit-pick: with the S6 case I'd received a charging cable, a headphone extender cable (to help headphones fit into the constrained headphone jack input), and a screen protector--unfortunately the S9 case doesn't come with the same bonuses (but I realize I was a bit spoiled with those add-ins). 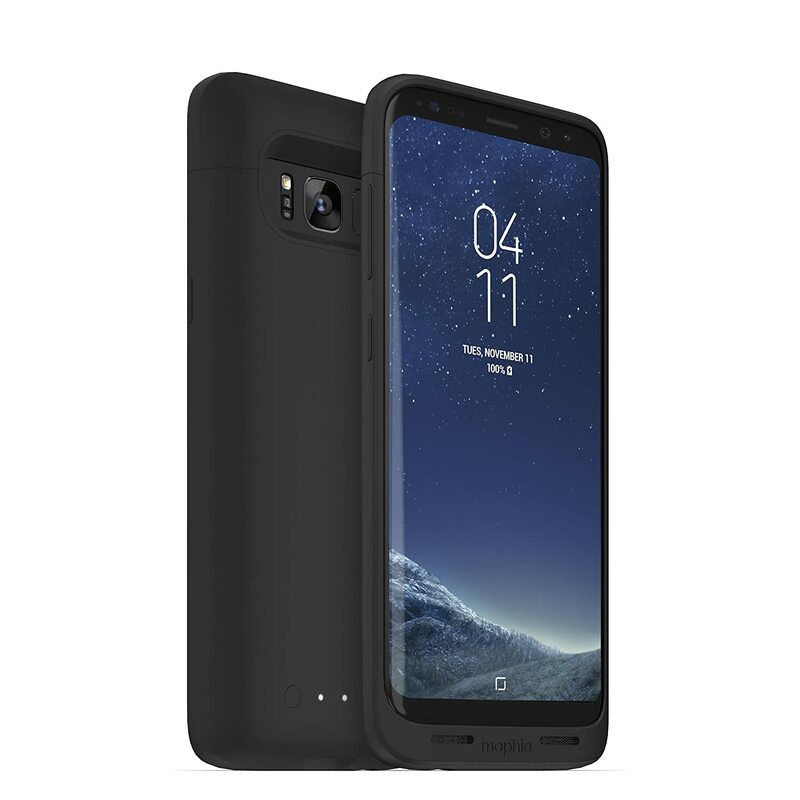 I expect the S9 battery case to perform well as I use it over the coming months (and hopefully years, considering they offer a generous warranty with the case), but I will be sure to update this review if I run into any issues with the case along the way. UPDATE: After using the case for about a week, I noticed that my case would consistently begin charging my phone without having turned on the charging function. Additionally, the case would only charge my phone to about 75% when I did use it. I gave Alpatronix a call regarding the issue, and they express shipped a replacement case to me that works as it should. The new case powers on when I want it to and provides a full recharge. Good product. Nice construction and fit. Have had for a week and have had 2 occurrences of the battery case going into a mode where the lights in case are illuminated, that is charging the phone but the button is nonresponsive. It seems to go in this mode on it's own. Have learned that I have to remove the phone from the battery case and then reinsert and that seems to reset the battery case. I WANTED TO ADD TO MY INITIAL REVIEW. THE COMPANY NOTICED IN MY ORIGINAL REVIEW THAT I HAD A COUPLE OF MINOR ISSUES. AS A RESULT THEY IMMEDIATELY CONTACTED ME AND SENT ME A REPLACEMENT UNIT AT NO CHARGE. I AM VERY, VERY PLEASED WITH THE PROACTIVE CUSTOMER SERVICE AND AM NOW LOOKING FORWARD TO A LONG HISTORY WITH THE PRODUCT. THANK YOU, ALPATRONIX. 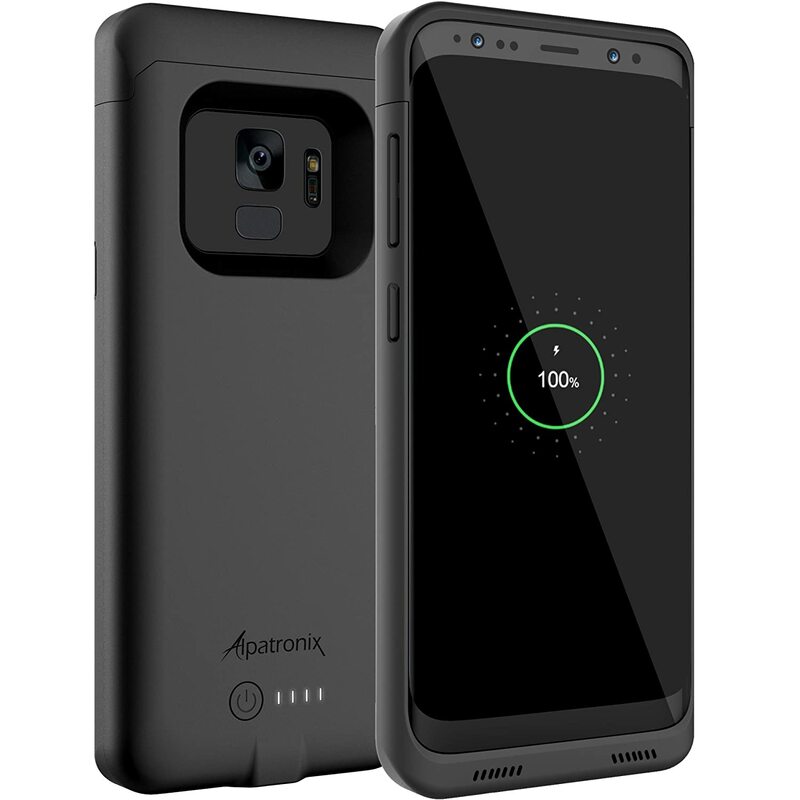 This is my 3rd Alpatronix battery case (all for Samsung Galaxy series) and I am once again thoroughly happy with a product that returns outstanding value for my money. I use this every day and have yet to experience any issue, but have confidence that I'll get prompt support if I do. Strongly recommend if you are in the market for a battery case. - Case is sturdy and easy to get on and off phone. 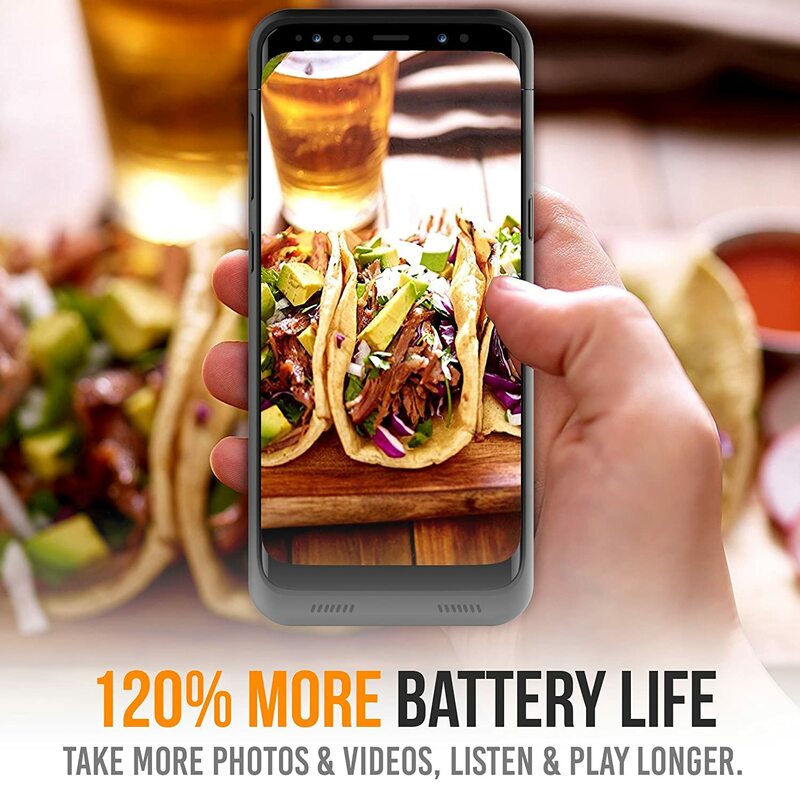 - Battery is consistent in charge time and delivery to phones battery. - Works seamlessly with my Qi charger in my car. - Outstanding customer service from the Alpatronix team. 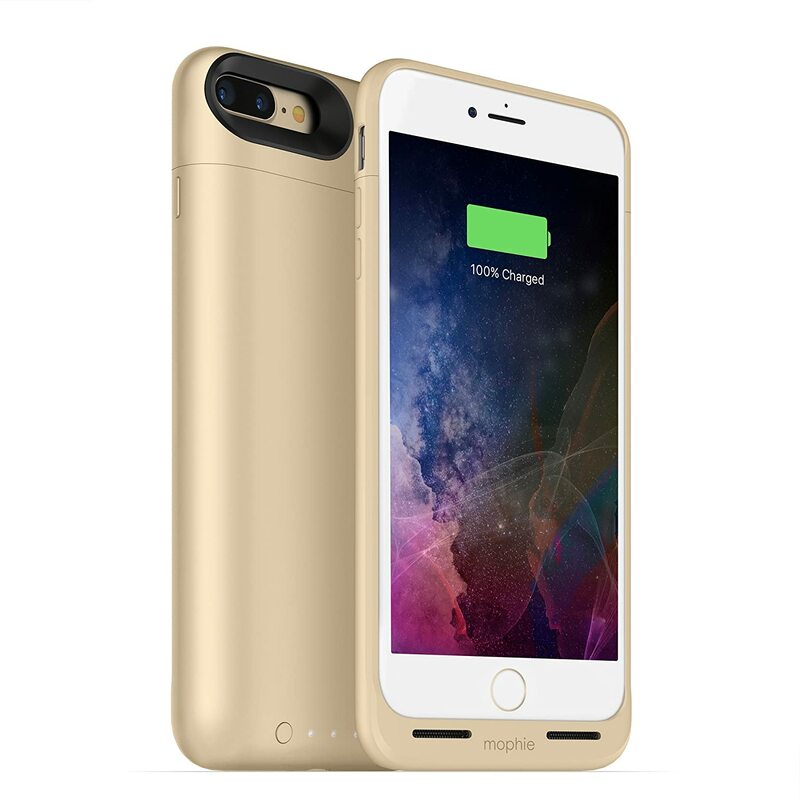 - Case is designed around delivering extended battery life and thus is pretty basic aesthetically. Edit: Loved it but like others volume buttons broke off. Emailed Sunday night with still zero response. I guess they need a little push to respond to their customers? 1 star until I get a response. Praise is given where praise is due. It's slim, keeps your charging port from wearing out, has a good feel and works for every day use. That's what it's about right? Can I use this every day? 2 weeks in and yes. It's comfortable, one of the slimmer cases, feels great . Edit: Works for devs. Use factory cord and it connected right away. My mistake. Edited review rating to reflect. Only wish is the case protected more screen. It's super comfortable the way it's made but the screen is vulnerable. Design vs protection is a balance. A touch more protection and it would be perfect. But no matter what it's the best on the market it looks like without being bulky. EDIT: Reduced down to 4 stars. After around 2 weeks both of the volume buttons have broke off. Never dropped the phone, work a desk job so doesn't see any abuse. Love the case but this is disappointing. Will work with Vendor. The battery case charged my Galaxy S9 great and recharged fast when plugged in with my Galaxy cable. However, I dropped the case once. I'm only 5'3" and my arm was down when it dropped so we're talking 2 feet absolute tops for the fall. It hit the sidewalk mostly flat but the top popped off instantly and bounced and now my phone has scratches on the top corner. I always kept it with a Zagg Shield and Otterbox case on it so it was previously flawless. When the top popped off it broke so it would just slide off. It fell off at some point yesterday and I can't find it. I tried to get the case off my phone today to put the Otterbox back on but it's near impossible to get off. the sides cracked like brittle thin plastic. The design is terrible and now it's worthless. I was looking forward to using it on vacation but that's not going to happen. If the case was made with as much quality as the charging capacity it would be awesome. As is, it's junk. **Update - I'm leaving my rating as 1 star for now since it's the product I reviewed but so far I would give the company 5 stars. They contacted me both by phone and email. I was left a name direct extension to call. The gave me the option to try another one or be refunded. I chose to try another one. Hopefully I just got a bad case. I definitely appreciate the pride they've taken in trying to resolve my issues.